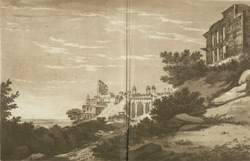 This is plate 11 from William Hodges' book 'Select Views in India'. The royal city of Fatehpur Sikri, south-west of Agra, was built by the orders of the Mughal Emperor Akbar in the 1570s. The city served as his capital, and contained ornate palace buildings, tombs and a large mosque. When William Hodges saw Fatehpur Sikri in 1782 he remarked that the palace "is in total ruin ... the only part which serves to give an idea of its former grandeur is the principal gate".